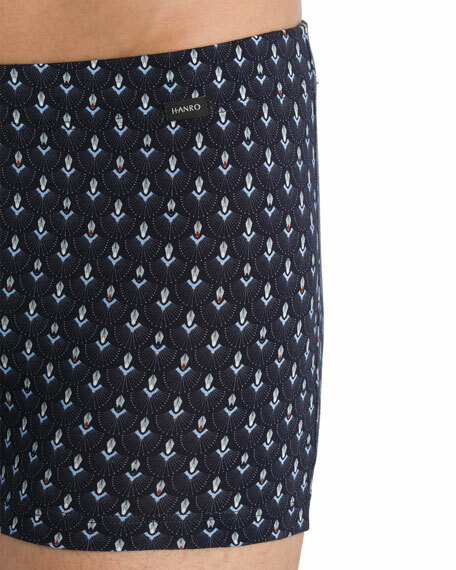 Hanro boxer briefs from Elias Collection. 2(x)ist military stripes briefs with Original Contour Pouch. Waistband at hip level. Microfiber waist with logo. 4-inch side length on Medium size. Polyester/spandex. Imported. 2Xist military striped boxer brief in sporty moisture wicking fabric with contrast color stripe detail. Tonal logo waistband. Formfitting. Polyester/spandex. 2Xist military striped boxer brief in sporty moisture wicking fabric with contrast color stripe detail. Tonal logo waistband. Formfitting. Polyester/spandex. Imported. 2(x)ist Pima Cotton boxer briefs with tonal trim. Long legs and keyhole-style fly. Logo waistband at hip level. 11-inch side length on Medium size. Pima cotton. Imported. 2(x)ist luxury stretch cotton boxer brief. 11" side length on Medium size; 5" inseam. Soft, flexible, breathable. Flat no-show seams. 2(x)ist luxury stretch cotton boxer brief. 11" side length on Medium size; 5" inseam. Soft, flexible, breathable. Flat no-show seams. Soft microfiber waistband with logo. Contour Pouch for support. Low rise. Tag free. Pima cotton/spandex. Imported.